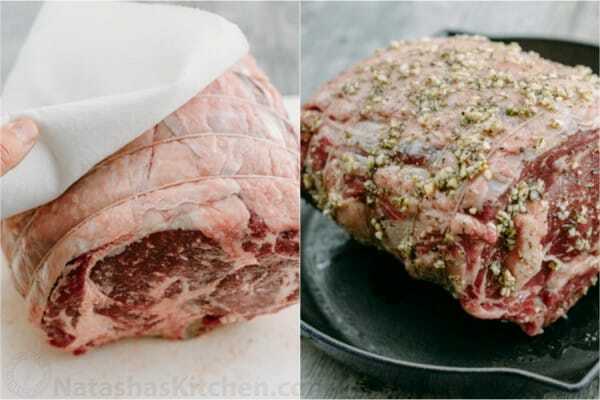 A garlic-crusted Prime Rib Recipe with a trusted method for juicy, melt-in-your-mouth tender prime rib roast. Watch the video tutorial and learn how to trim, tie, wrestle (kidding), and cook a standing rib roast. Repeat after me, “prime rib is not scary.” It’s actually very simple to prepare. 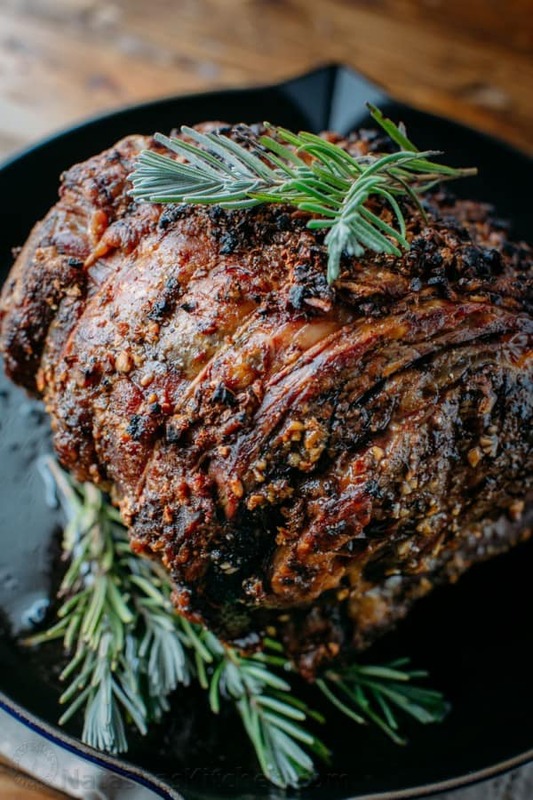 Prime Rib Roast can be intimidating because it is an expensive cut of beef and is usually made for important life events or holidays, but really, this is not hard to make. 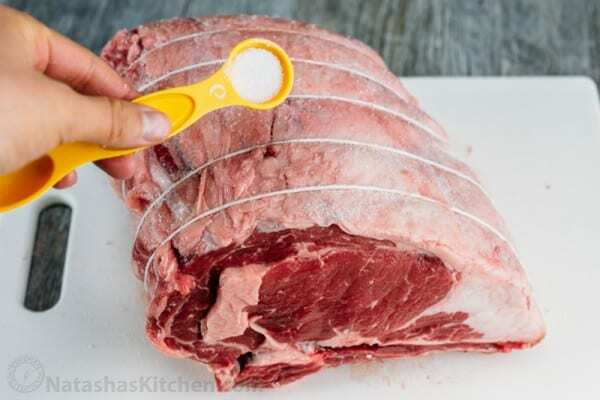 The secrets to a great prime rib are (1) a meat thermometer and (2) a trusted method. TA-DA!! 🙂 Prime rib pairs really well with creamy mashed potatoes and baked asparagus for the ultimate holiday feast. 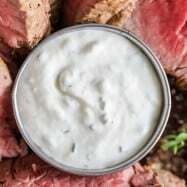 And don’t forget the Creamy Horseradish Sauce! 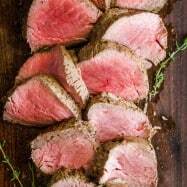 What Cut is Prime Rib Meat? There are 2 grades of prime rib at the grocery store; prime grade and choice grade. Prime grade has more fat and marbling and can be considerably more expensive per pound. 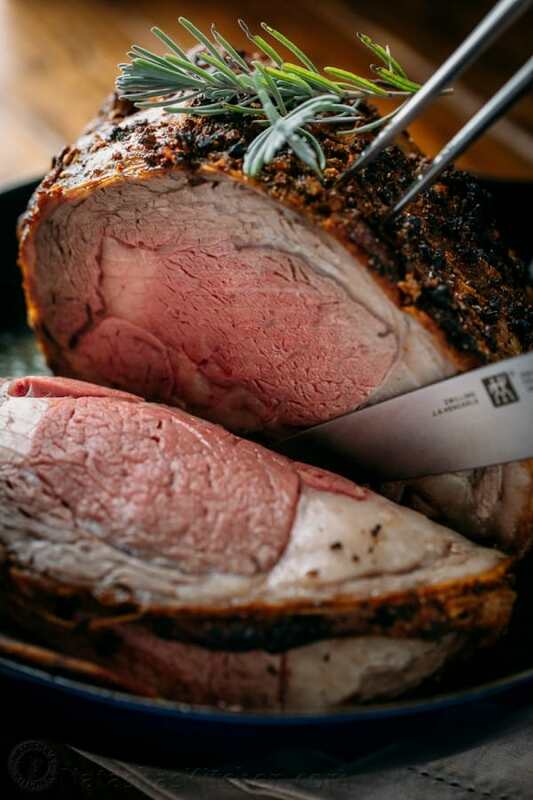 Ask your butcher whether your roast is prime or choice because it isn’t always clear on the packaging and most cuts sold are actually “choice”. This recipe works for either prime or choice, so go with the best you can buy. Look for Bone-in prime rib, also known as a “Standing Rib Roast.” We used a 7 lb bone-in Beef Prime Rib, but you can use larger or smaller roasts and modify the baking time per the “Prime Rib Cooking Time” chart below. We included our Amazon affiliate links below for tools to make prime prime. Pre-cutting the bones away is completely optional but will make carving easier when ready to serve. It’s best to do it ahead than struggle with it in front of company. Removing and re-attaching the ribs with string doesn’t change the juiciness of the roast at all. 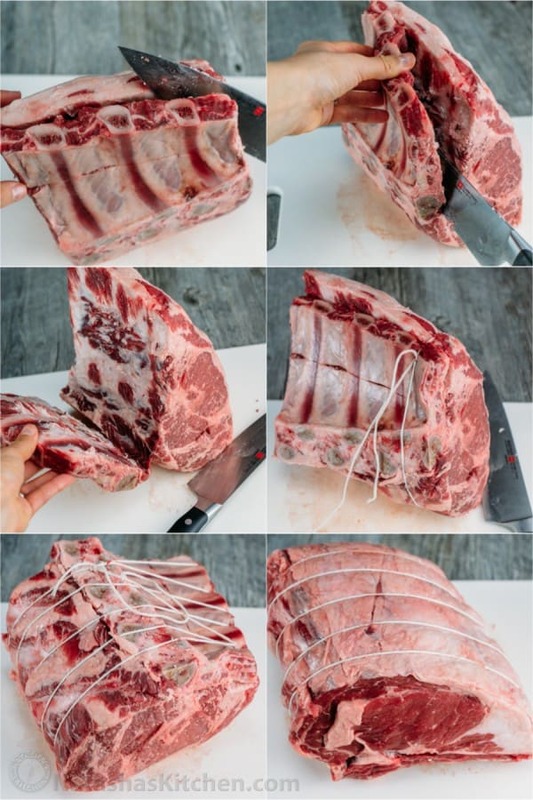 Cut away the bones and tightly tie them right back onto your roast with kitchen string, looping the string around in 1″ intervals. A butcher can cut away the ribs and tie the roast for you (usually free of charge). 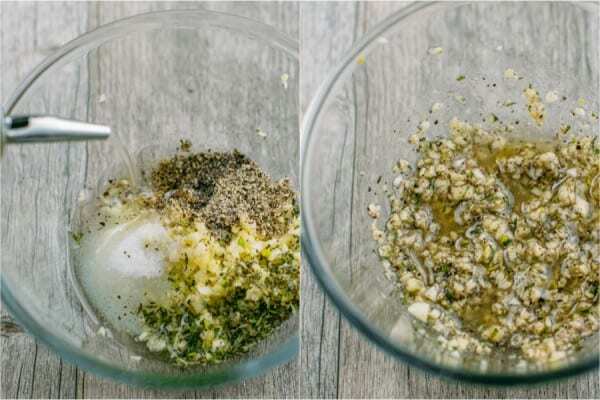 Stir together: 6 finely chopped garlic cloves, 1/2 Tbsp salt, 1/2 Tbsp black pepper, 1 tsp chopped fresh rosemary leaves, 1/2 tsp chopped fresh thyme leaves and 3 Tbsp olive oil. Note: Do not use a garlic press as pressed garlic burns under high heat. 1. Sprinkle meat all over with about 2 tsp salt, cover loosely with plastic wrap and let it rest on the counter for 3 hours to come to room temperature. The roast will bake more uniformly if it is near room temperature. When nearly at room temperature, Preheat Oven to 500˚F with rack in the lower third of the oven. 3. Pat the roast dry with paper towels then rub all over the top and sides with prime rib rub. Place into a roasting pan, rib-side-down. Put an oven-safe meat thermometer into the thickest portion of the meat and cook according to the Cooking Time Chart Below. My 7 lb roast baked at 500˚F for 15 minutes then at 325˚F for 1 hr 30 minutes for medium doneness. A colder or thicker roast will take more time to cook and oven strengths can vary so a meat thermometer is ultra important. The internal temp of the roast will continue to rise 5-10 degrees even after it’s out of the oven so don’t over-bake it. You can put it back in the oven if you want it more done. 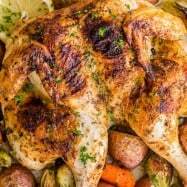 The garlic crust and initial roasting over high heat seals in the juices and makes every bite so tender and flavorful. I hope you are super pumped to make your own prime rib roast after watching this! If you enjoy our videos, please subscribe to our Youtube Channel and be sure to click the bell icon so you’ll be the first to know when we post a new video. I learned to make prime rib from my blogging friend, Elise of Simply Recipes and I am using her method for prepping and roasting. We always have prime rib at Christmas dinner (and sometimes we go all out and make turkey also!) If this recipe graces your holiday table, I hope you tag your photos with #natashaskitchen so I can see your beautiful creations. What is the star of your holiday table? I’d love to hear about your traditions in a comment below. Thank you for your recipe. One thing I do, is that I roast using a cast iron skillet. I heat my skillet to 500 degrees then remove it from the oven and set atop my burner with heat on high. I then drop my oven temperature to 350. I use my high temperature skillet to sear both ends of the roast. This locks in the juices on each end, keeping the prime rib tender and moist. After searing I place it in my cast iron skillet and return it to the oven to roast until done. After I remove it from the oven, I let it sit for about 15 minutes. I then cut it to serve, and will use the cast iron to further cook individual slices to order per each guests wants, on top of the stove. This lets those that want a more done cut to have one. you’ve won me over your prime rib looks amazing. I purchased a almost 19 pound roast from costco. Feeding 17 family members so wish me luck. 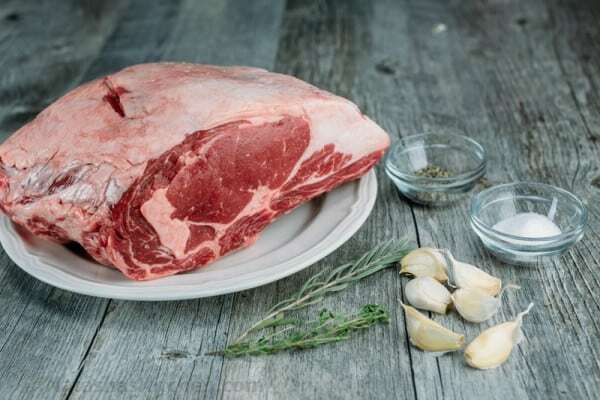 Would you adjusting cooking temperature and times with a boneless prime rib roast? Keeping a roast at room temp overnight is dangerous. You should not leave meat unrefrigerated more than 2 hrs without risking food poisoning. 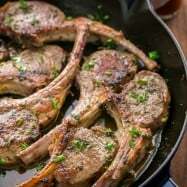 I also am going to lower my sear temp due to smoking and burn too quickly for my oven – Are you Searing from the 3rd rack from top in your oven? To take 25 minutes…and 320 for a slower roast? Is 127 pull temp getting you a rest time of 30 minutes and a medium or medium rare roast? It’s the first time I’m cooking a bone in roast so I want to put it in the oven at 12:30 and serve it by 2:30. It’s a 10 roast and bones weigh 3lbs total weight of 13 pounds. My bone out roast usually only takes 1 and 45 minutes total for medium after pulling at 123. And resting for 15 minutes. I use to cook these at 5oo and lower to 350 and I think I want a medium rare roast . My old method is too done. So I’m not sure if I should wait to 127 to pull roast. Ok, we are following this recipe for our huge beast of meat. 500 degrees for an hour and a half is nerve wrecking but I’m crossing my fingers! Thanks! I hope you love it!! “Bake in a fully pre-heated oven at 500˚F for 15 minutes. Reduce heat to 325˚F and continue baking” – not 500 for the full 1.5 hours 🙂 I hope this helps. Christine!! Oh my, I hope you read this comment!! I don’t think you are supposed to roast it at 500 degrees for an hour and a half.😨 I’m pretty sure you do that for only 15 minutes and then lower to 325 degrees for the remainder of the cooking process, at which point you cook according to pounds and desired doneness. I’m not sure where I read an hour and a half. Ha! Must have been another recipe. We are trying your method for this gorgeous hunk of meat. Although, I think we are going to do 450 for about 20-25 minutes then lowering to 325. We do have a good meat thermometer so we should be good! Thanks for the help. I’ll update later! Have you ever made Yorkshire pudding from the drippings? I would like to give it a try. It looks delicious!!!! Can you let us know which meat thermometer did you use? My goodness, Natasha! Another winner!! Can’t go wrong with your recipes. Hi Natasha, Do you have a horseradish sauce recipe to go with this? I know you mentioned you ran out of time to post it but I was wondering if you can post a recipe now. 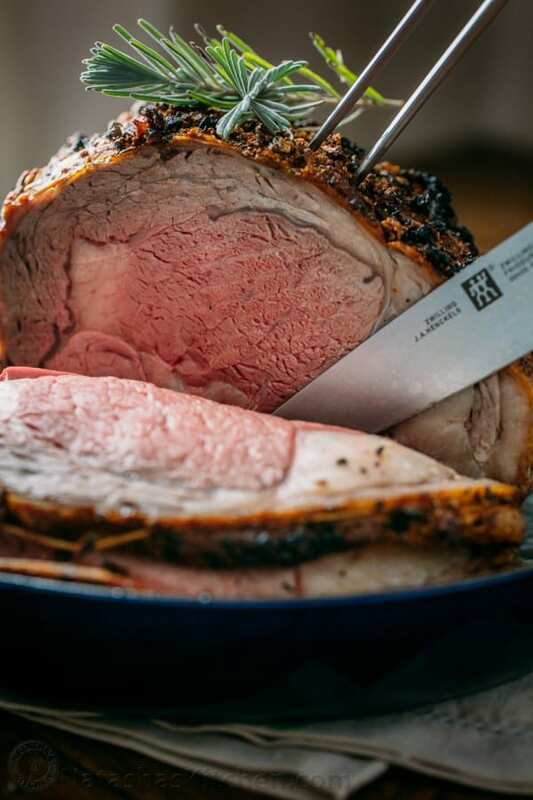 Do you recommend any specific horseradish sauce for this prime rib? 4. Cook in 133 degree bath for 24 hours (up to 36). Note: if you’re cooking meat for more than 2 hours, the temperature must be over 129 degrees. 5. Repeat steps 2 and 3 for the bones and freeze for another time or cook right away at 133 for 72 hours. 8. Sear each side of the roast in a heated cast iron skillet with oil for 2-3 minutes/side. The beauty of this method is first, the roast cooks at the desired final temperature and the entire roast is at this temperature, not just the center. Second, because it’s been cooking in its juices, you do not have to let the roast rest before slicing it. Third, your oven is freed up for other things for that big holiday dinner. 1. The heating element. I use Anova Precision Cooker (anovaculinary.com). You can google it. I looked at it on Amazon, waited two weeks, got a $50 off coupon and then bought through Amazon. Anova runs frequent $50 off coupons too, but with your blog, you might be able to get the coupon anytime. Their site also has a bunch of recipes. Instead of a heating element, you can get a sous vide oven. These run into the hundreds of dollars, and after doing a lot of research, I decided this was not for me. It wasn’t just the cost, it was the storage issue as well. If you get the oven, you can skip #3 and possibly #4 below. 2. A vacuum sealer. I use FoodSaver V4440, which I picked up at Costco. I’d had one previously, but it was 10-15 years old and I wanted a more fancy one. If you don’t want to purchase a vacuum sealer, you can use ziploc bags and use the air displacement method to remove air: place the food in the bag, place the bag in the water bath and the water will displace (push) the air out of the bag. I tried this method too and prefer using a vacuum sealer. It makes more sense for larger cuts of meat, like a roast, tri tip or ribs. 3. Some kind of vessel for the water bath. It has to be deep enough to submerge the food and be able to attach the heating element to. At first I used a large stock pot, but the problem with that is if you cook something for more than a couple of hours, you need to insulate the pot and cover the top to reduce evaporation. I wrapped towels around the pot and used plastic wrap on the top and a towel on top of that. That became cumbersome fast. I ended up buying a Coleman 16 Quart Excursion Cooler and had my husband cut out a round notch in the front corner of the lid to fit the heating element. 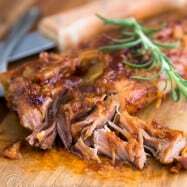 It works perfectly – I’ve cooked 72 hour pork baby back ribs and had little to no evaporation losses. The other thing about having the cooler is I can fit more items into it. 4. This is optional but I recommend it: Sous Vide Supreme Universal Pouch Rack (http://www.sousvidesupreme.com/Shop/Accessories/EN-US/SousVide_Supreme_Universal_Pouch_Rack-37/Product.aspx). It fits perfectly in the cooler and helps keep the food separated from each other to allow better water circulation. It also helps keep food submerged if you place the food pouches in and turn it on its side. a. It’s so flipping easy and the results are simply scrumptious. Big bang for the effort! b. I can freeze the food vacuumed sealed either before or after cooking for cooking in bulk. Right now I have two frozen raw tri tips ready to go (btw, this makes excellent lunch meat) – I just have to plop them into a water bath for 24 hours. I also have at least one pouch left of already cooked baby back ribs. I just need to defrost, reheat (either in the microwave or the water bath at the temp I cooked it at) and complete the final step (broil or bbq with bbq sauce) if I want to. 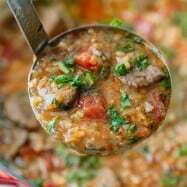 c. You can purchase less expensive meat or on sale and get great results because you’re cooking it longer at a lower temperature so all the connective tissue has time to break down. Plus you’re cooking it in its own juices. d. You cook food at the final temperature you want it at and the whole piece of meat is at that temperature, not just the center which leaves the outer part overcooked. No no need to let the meat rest before slicing. You can cook veggies sous vide, but I didn’t find them to be amazing. It’s said that cooking eggs this way is the way to go, but I haven’t tried it yet. There are other things that can be cooked sous vide, but I mostly do just meats.